Last week sucked. It’s a long story, and honestly, I don’t feel like telling it. Weight Check: 165.2 pounds, down 1.2 from last week. That’s about the only thing that went well. There was bad weather, illness, the fact that my house is being renovated, and work stress. Even so, that’s way too little running. I did finally get out there on Saturday. It was windy and still damp from some rain earlier, but not cold. My legs still felt OK. I don’t know how I’m keeping my speed up considering how little I’ve been running, but somehow I’m still running well. I also decided to do a rare Sunday run, because, well, I didn’t want to finish the week with just one run. It was chilly and damp, but not too terrible. My legs felt OK. Once again, I sped up on each mile and finished strong. I don’t understand it either. This week, I did manage to get out there Monday morning. It’s looking like we’re going to get a lot of rain this week, though, so I don’t know how much I’ll be out there. We’ll see. This week was pretty crazy. The running was fine, though. I’m still not quite at the quantity that I’d like, but the quality has stayed pretty strong. Weight Check: 166.4, down 3.7 pounds from last week. I don’t understand it either. I did pick up a pretty mild cold this week which may have impacted my appetite. Still, I’ll take it. A little more each week, I guess. Monday, the weather was cool, 34 degrees. I sped up along the way, which is pretty common these days. I felt pretty good and finished strong. On Tuesday, the weather was close to perfect, 48 and clear. I felt fine. Once again, I sped up over the course of the run. Yeah, my comments are getting less detailed without a coach. The majority of my runs have been pretty similar, though, and they’ve been the exact same distance. There’s a two day gap for Wednesday and Thursday, which is not ideal, but an improvement. I got back out there on Friday. It was warm, 62, but not humid. I think I’m coming down with a chest cold. Clearly, neither of these affected my running, because I ran pretty fast. It was my fastest run of the week. I’m pleased. Saturday, I took it a little slower, since I really shouldn’t be going all out on every run. I felt fine. I still managed to gradually speed up over the course of the run, I just started at a slower pace than my recent runs. I wish I had gotten out there sooner, then I might have gone a little farther. Still, it was a nice relaxing run. So, yeah, that’s it for this week. I did manage to make a little bit of progress on my Charleston write-up, so there’s that. Next week, well, hopefully I can get back to 5 days, and maybe even a run that’s more than a 5K. This is late because I got sidetracked. I watched a terrible football game (I say that not just because I was unhappy with the outcome, but I was indeed unhappy with the outcome), then I was busy Monday and Tuesday nights, so I’m posting this on Wednesday. And if you think this is late, wait until you see my January wrap-up. And my Charleston recap, too. One post at a time, I guess. I got a little better last week, although I’m not quite where I want to be quantity-wise. Quality-wise, I’ve managed to somehow stay pretty strong. I don’t understand it either. Oh, and in case you’re wondering, around here I think the coldest it got was 18. Which is pretty cold, just nothing like they saw in the Midwest. Baby steps, I guess. Better than last week (which is a pretty freaking low bar), but still not where I want to be. Monday felt cold, but was actually 36. I ran better than Sunday. I didn’t feel tired. I started with a reasonable pace on the first mile, then sped up each mile after that. It was a pretty good run. I took a few days off. Wednesday was legitimately cold, and I think not running was probably the right choice in a vaccum. The problem is that Thursday was not quite as cold, and Friday was cold but bearable, and I skipped those days too. Well, Saturday, even with my parents visiting (and possibly because my parents were visiting), I got out there and ran again. It was right around the freezing mark, which isn’t terrible. There was an odd GPS glitch with 30 seconds of no data, but it looks like I ran really well, and sped up over the course of the run. I felt pretty good, too, in spite of the cold and the layoff. So far, I’ve run 2 out of 3 days, which isn’t bad, but I really need to get out there on Thursday. We’ll see. So, yeah, I fell off the wagon. I did finally get back on (and spoiler for next week, got back out there Monday morning), but my first week without a running coach was not ideal. And since I felt like I needed a short term goal, I signed up for the Elizabeth 8K Road Race, which I’ve added to the sidebar. (I’m still doing the Teal Diva 5K, I’m just listing one upcoming race at a time.) There’s also about a 95% chance I’ll sign up for a fall half marathon, and hopefully a warmup race before that. Weight Check: 165.6, down 3.7 pounds from last week. This wasn’t the way that I wanted to get my weight back down. On Saturday afternoon, I got hit with what I think is a migraine. It’s a pounding headache (which probably feels even worse to me because I almost never get headaches) that’s followed by nausea, and it usually ends with my emptying the contents of my stomach into the toilet, and that’s what happened Saturday. I think I was on track for a small loss before that, which, considering how little I ran, is pretty good. Still, I do not recommend the migraine weight loss plan. Let’s just go through each day. Monday I had the day off. It was really freaking cold in the morning, so I waited until it warmed up a bit, which turned out to be 12:43 PM, a rare afternoon run. It got up to a balmy 34 degrees at that point. It was still pretty cold with an occasional wind that cut right through me, but I gradually sped up over the course of the run, so I was pleased. I planned to take Tuesday off. I was thinking that I wanted to drop back to 4 days a week of running, and the easiest way to do that would be to make Tuesday a rest day. That was fine. Wednesday morning, there was some cold rain, and the temperature was hovering just above freezing. It’s bad enough when it’s raining and 33 or 34 degrees, but if it does drop down to 32, then it gets a whole lot worse. So I decided with no race on the horizon, and with the Y probably still too crowded with Resolution Runners for my taste, I could take another day off as long as I got back out there the next day. Thursday was when it started getting bad. I don’t have a good excuse. It was cold, but not that cold, and it was dry. I was wasting time after I got up, and the next thing I knew, I didn’t have time to run before leaving for work. Friday wasn’t any better. Time wasting in the morning, and no run. Saturday kinda sorta almost had a decent excuse, because I was planning on going to the Charlotte Women United March, but I still could have gotten up a little bit earlier than I did and squeezed in a short run. The march was good, and luckily the migraine didn’t hit until just before I got home. Sunday, I finally decided that I needed to get back on the wagon. (Side note: I did my weigh in before the run, so my weigh in was after only 3.11 miles of running for the week.) I started too fast, and struggled a bit in mile 3 because of it. Still, I did better than expected after a long layoff. This week, I’m still going to have to work around a little bit of weather, but I should be OK. And I’d like to work on my Charleston recap, too. I recovered pretty nicely from Charleston. This was my last week with my running coach. With no major goals or big races on my radar, there’s really no point for me to have a coach. She’s been great, though. She had me ready for New York City in 2017 (it’s certainly not her fault that my stomach had other ideas that day), and she did the best she could trying to get me ready for New York City in 2018 (if nothing else, I think that without her I probably would have ended up over 6 hours). She gets to leave on a high note, though, she definitely had me ready for Charleston. (No, I haven’t finished my race recap.) I’m fundamentally a better runner after working with her. Of course, now I might not be so diligent about jotting down notes after runs, so my weekly wrap-ups might suffer. We’ll see. I started looking around at some other races, and while ultimately I decided not to sign up for any, I noticed a few races had moved around. The Hot Chocolate 15K (They do races in a bunch of different cities, I believe last year was the 1st year they’ve run it in Charlotte, but I was in hernia surgery recovery mode so I missed the first one) which had been in mid-February last year, was Saturday (as in yesterday as I write this), the Charlotte 10 Miler was moved from mid-to-late February up to the beginning of February, and the Joe Davis 10K/5K, normally early January, will be in early March this year (but like in 2018, both races start at the same time, you can only do one race unless you’ve got a time machine). Like I said, I decided not to sign up for any of them (I’ll have a separate post explaining why, although I probably wouldn’t have signed up for the Hot Chocolate 15K one week after Charleston), I just thought that was interesting seeing all these races moving around. Weight Check: 169.3 pounds, down 1.2 from last week. Woohoo! That’s still higher than I’d like, but getting below 170 definitely gives me a small psychological boost. In a week where I didn’t have a whole lot of miles and I went out to eat 4(!) nights in a row, that’s excellent. I guess I’m going to have to reformat that table, since I no longer have any kind of training plan. My coach recommended that I wait until Wednesday to start running again. As usual, I think she had the right idea. Wednesday was cold, 31 degrees. My legs weren’t completely recovered, but they felt good enough. I was definitely a little slower than my previous weekday runs, which I expected, but it wasn’t too bad. I did gradually speed up as my legs warmed up a little in more ways than one. On Friday, it was pretty close to the same weather as I saw in Charleston last Saturday, but it’s not as bad when I’m running 10 fewer miles. My legs seemed to have recovered. I was pleasantly surprised and had a nice speed up on the last mile without pushing too hard until near the end. Saturday was cool and damp with occasional mist, but no rain. My legs felt fine. I was a little slower on the first mile than on Friday, but I was a little faster after that with a nice push at the finish. Next week, well, I’m on my own. I figure I’ll run 3.1 miles Monday, maybe 4 on Wednesday, another 3.1 Friday, and 4 or 5 Saturday. It depends on the weather, of course. It’s supposed to get really cold this week. I had to update my header picture. (This is a good problem to have.) I got my PR by just under 13 seconds and had a strong finish. I’ll have a full report eventually. I’m late because I wanted to wait until I got an official weigh-in on Monday morning (I forgot about it Friday morning before I left town) and I ended up going in to the office on Monday instead of working from home (which is rare on Mondays), and then I got together with friends Monday evening (which is also somewhat rare). I forgot to mention in my last wrap-up that I signed up for the Teal Diva 5K again this year. They moved it again, now it’ll be downtown, which means I’ll probably have more room to run, but it also means it probably won’t be as flat. And since I haven’t signed up for any other races, that’s currently my next race. Weight Check: 170.5 pounds, down 0.9 from last week. I definitely enjoyed myself in Charleston after the race (Translation: food and beer), so I can’t complain. It would have been nice if I had gotten down into the mid-160s for the race, but I still did OK.
Monday was cool but still pleasant. My legs felt OK. My pace looked a little inconsistent, but the general trend was that it got faster as I went along. I’ll take it. On Tuesday, it wasn’t as cool, 51 degrees, but very comfortable. My legs felt fine. I got faster as I went along. My average pace was a hair slower than Monday, but it was still a pretty solid run. Wednesday was definitely cooler, 42 degrees. My legs felt fine. I started out a little slow, but once I got going, I really got going, with an average pace for the final full mile of 10:07. Friday was a shakeout run. I’ve got mixed feelings about running the day before a race, but if I wanted to do 5 runs for the week, my options were either run 4 days in a row and take off Friday, or take off Thursday and do a shakeout run Friday. My coach recommended the second option. (Considering my updated header image, I think it worked.) It was cold, 32 degrees, but it would have been worse if I hadn’t waited until after 9 AM. The sun helped. My legs felt OK. I wanted to take it easy of course. I was maybe a hair faster than I wanted on the first mile (although the cold probably got me to subconsciously speed up a little bit), but I settled into the pace I wanted on the second mile. Also, I wore my t-shirt from the 2016 Charleston Half Marathon. That one went pretty well. Saturday was the race. I’ll do a full write-up, of course. And, yeah, I’m pretty happy with how it turned out. Up next, I start running again on Wednesday. I’ll ease back into it this week. I made it to 2019. The first day was a little rough (and it was mostly my fault), but the rest of the week went well, even if I had to juggle my schedule a bit. I’m basically caught up now. I haven’t done a post about my goals for 2019 because, well, I want to see what happens in Charleston first. Weight Check: 171.4, up 2.9 pounds from last week. Yikes! I did go to a party last night and did some grazing, and I did overindulge a bit on New Year’s Eve, but otherwise, I didn’t think this week was that bad. I’ll just have to buckle down a bit this week before I head to Charleston. On Monday, I closed out 2018 with rain. The rain wasn’t that heavy, and it stopped just before the end of my run, but luckily it wasn’t too cold. My legs felt OK. My pace was a little more inconsistent than I’d like, but it was in the range that I was hoping for, with a little push near the end. I did add on an extra .18 to close out 2018. So, Tuesday. Well, I was out late on New Year’s Eve and had a little too much fun, and the weather felt like July (67 degrees and really humid), so this run did not go well at all. Eh, it happens. I figured I’d be fine after a day of rest, and the temperatures were supposed to cool off just a little bit, so my next run would probably be better. (Spoiler: It was much better.) I did manage to continue my tradition of running on New Year’s Day, which I’ve done every year since 2013. I also added .19 to the end to welcome 2019, and I’ve done something similar every year since 2015. On Wednesday, I definitely recovered from Tuesday. The weather certainly helped, 52 and overcast. I was a little faster on the warm up than I’d like, but I sped up a little because someone let their dog out in the front yard. (It was a small dog and wasn’t a threat, other than maybe to my hearing because it barked loudly the entire time I was near it.) I don’t think it affected the rest of my run. I kept a fairly steady pace for most of the workout with a slight increase towards the end. I did need to take a walk break at the beginning of the cool down, but after that, I finished the cool down at a respectable pace. Friday I had to get up early so I could run 9 miles before work. I was greeted by rain. Luckily, it was never really heavy, there was no wind, and 53 degrees isn’t too terrible. My legs felt fine. I did stop just before mile 5 to get some water – I left a bottle outside my house. On Saturday, it was cooler, 44 degrees, but still pretty nice for running, and after Friday, I really appreciated the fact that it was dry. Apparently I didn’t feel much of an effect from the 9 miler, and my legs felt fine. I’m really pleased with how it turned out. Also, I didn’t get interrupted by work, which is always a plus. Up next is the Charleston Half Marathon. A nice flat course. It might be wet though. I’m watching the forecast. Still, based on my training, I’m feeling pretty good about the race. We’ll see how it goes. Well, it was tough, but there were some bright spots, and I made it through to the end. That’s a good summary of the 2018 New York City Marathon, and of the entire year of 2018. I only had one goal for 2018. 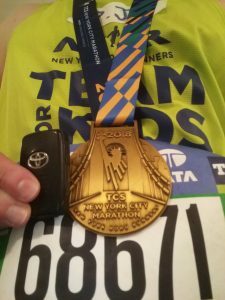 Goal 1: Finish the 2018 New York City Marathon. I had to go through a charity, I did a poor job of fundraising (to be fair, there were a few stretches where I wasn’t 100% sure I’d be able to run the race, and it’s even more difficult to ask for donations when you don’t even know if you’ll be running), my training went really badly, and my lack of mileage led to a lot of walking after mile 18 or so. But I finished, and after 2017, that’s an accomplishment. I didn’t set a mileage goal, which is good, because I probably would have set it higher than 1,150.08 miles. Considering, well, everything, I’m glad I was able to get that many miles, even if it’s my lowest total since 2014. Weight Check: I forgot to do a weigh in on December 31, so I have to go with my last official weigh in of 2018, from December 30, 168.5. I started the year at 166.3. So, uh, a gain of 2.2 pounds. Not ideal. I ran in Portland again. The weather was glorious (the beer was pretty good, too), and I had some really good runs. The Teal Diva 5K raised a bunch of money for ovarian cancer, and, considering everything, I ran pretty well. I recovered from whatever the hell was wrong with me in late August/early September (more on that under Lowlights). I finally succeeded in mostly eliminating Mountain Dew from my life. I’ve switched to no/low calorie sodas, primarily Coke Cherry Zero, and occasionally Diet Mountain Dew or regular Coke Zero Sugar. I don’t know how much it helped (and I probably should still be drinking water instead), but I’d say it’s a small step in the right direction. Like I mentioned earlier, my fundraising efforts did not go well. I started the year with a hernia. I had to defer the 2018 Charleston Half Marathon to 2019. I had to reduce my mileage before my surgery, then I couldn’t run at all for a full month. In late August, I started getting severe fatigue after 10-12 miles, which is not normal. I missed an entire week of training. I had to get my heart checked out. I went to a sports doctor. Nobody could figure out exactly what was wrong. But whatever it was, the rest seemed to help a little bit. Still, it caused me to miss a significant chunk of my training, leading me to be undertrained headed into my goal race. And then there was the New York City Marathon. I didn’t have the mileage in training that I wanted. To be honest, I didn’t really have the race I wanted. The last, oh, 8+ miles of the race were pretty brutal. The battery for my Garmin Forerunner 220 ran out after 21.85 miles. However, it’s still a race through the city where I was born, the greatest city in the world (I know, I’m biased). I still loved it. And I still think my last minute decision to put my name on my shirt was a great decision. The crowds are already pretty great when they don’t know your name. Throw in a whole bunch of “Go P.J. !” cheers from people other than my parents, and you’ve got an even more amazing experience. I still got to run through Brooklyn. I still got to turn on to 1st Avenue. I still got to see the sign that says “Welcome To The Bronx.” And I got to cross the finish line. There’s not much else to say. It was a tough year, and I’m relieved that I got through it. This month was about getting ready for the Charleston Half Marathon. For the most part, it was a good month, although I didn’t finish as strong as I’d like. I’m glad I did that thing where I ended the last run of the year with an extra .18. I missed a couple of days due to our winter storm, and missed another day due to my sore calf, but I still had a pretty solid month. Shout out to my December 1 run, also a long run (only 8 miles) with a significantly faster last mile. Unfortunately, this one had another run to compete with, December 15, when I made it 9.16 miles (out of a scheduled 10) in really miserable wet conditions. December 26 had a sore calf, though. Actual pain beats plain old suffering. Both runs sucked in different ways. Also, on December 26, I was supposed to run 50 minutes, and I ended up running just over 46 minutes (and part of that was just trying to get up to 4.01 miles). I have to say, outside of those two runs, it was a good month. Next month (Hey, this’ll be early enough that I can actually do a preview of the next month), I’ve got the Charleston Half Marathon on January 12. After that, recovery, and then, well, I don’t know yet. Hey, look, my New York City recap is finally done! My left calf decided to flare up last week for no good reason, which sucked, but I got through it. That’s 2018 in a nutshell, parts of it sucked, but I got through it anyway. Weight Check: 168.5, up exactly one pound from last week. I ate and drank a lot, and to only gain one pound from all of that…well, it doesn’t quite qualify as a Christmas Miracle, but I’ll call it acceptable. It could have been a lot worse, I guess. Yeah, there’s an asterisk next to Wednesday, which I’ll get to in a minute. Monday I was at my parents’ house. It was cold, 37 degrees, but not too uncomfortable. My legs felt OK. I’m not sure what happened in mile 2 that caused me to slow down, but something clicked on mile 3 and I got through the last 2 miles at a faster pace. Considering how I don’t like running in my parents’ neighborhood, it turned out pretty well. I took off Tuesday. We drove to my sisters’ house in Raleigh after my run on Monday, so I got to see my nephews open all their presents on Christmas morning. They’re the best. I expected Wednesday to be tough, the day after a holiday. I didn’t expect my calf to start feeling sore during the warm up. I tried taking a walk break to see if that would help, but it didn’t. I was a little late starting the main workout (that was mostly just a brain fart, but I was probably a bit distracted by my calf). Anyway, after a few minutes at an increased effort, I was struggling to stay under an 11:00/mile pace (a minute per mile slower than my recent workout paces), and my calf didn’t feel any better. So I took a 1 minute walk break after 7 minutes, turned around about halfway through the walk break, and tried increasing my effort again for 7 minutes. I was a little faster, though still noticeably slower than on my recent workouts, and my calf was still hurting, and after 7 minutes, I started my cool down with some walking. I resumed running more slowly, and my calf started to feel a little bit better. I added a little bit to the end of the cool down to get to 4 miles. I originally had a run scheduled for Tuesday, but my coach noted that I could push it to Thursday (my normal rest day) if I wanted to. And that was my original plan, but after my calf problems on Wednesday, I decided to rest on Thursday. My coach agreed with this strategy. Friday, I was back home. I got on the treadmill one last time before the Resolution Runners show up. My calf wasn’t quite 100%, but it felt a lot better than Wednesday. Still, I took it somewhat easy, starting out at an 11:32/mile pace, going to 11:19/mile after 1 mile, then waiting until around 2.8 miles to bump it up to 11:07/mile for the finish. My mind hated it as usual, but I think it was good for my legs in general and my calf in particular. On Saturday, the temperature was pretty comfortable although it was pretty damp. My calf seemed to be OK. On the first few miles, it may have felt just a little bit off, but I’m pretty sure that if I hadn’t been focusing on it so much, I probably wouldn’t have noticed. My legs in general felt a little sluggish, though. It was a long week, and while I enjoyed seeing my family, I spent a lot of time eating, drinking, and playing with my nephews (who are still the best), and all of that probably didn’t help my running. It had rained on Friday, and while it wasn’t as bad as previous weeks – none of the greenway was flooded – there were a couple of muddy spots, one that I walked through to keep from kicking up a whole bunch of mud, and the other I took a detour around. It had stopped raining sometime Friday evening, so there weren’t many puddles left. I found one water fountain that hadn’t been turned off, and stopped there at around 2.3 miles. I had a Gu (with some more water) at around the 6 mile mark. I did take a couple of quick walk breaks on miles 10 and 11, but I did manage to speed up a little on mile 12. Overall, it wasn’t a great run, but I got through it, and my calf seems to be doing better. I’ll take it. This week, well, I start tapering for Charleston. I did wrap up 2018 this morning, so now I need to do a December wrap-up, a 2018 wrap-up, and a look ahead to 2019. You’d think finally finishing up my New York City recap would free things up, but no. Stupid calendar. My name is P.J. Smith, a runner living near Charlotte, NC. I lost my car key during a run once. Copyright © 2019 The Key Runner. All Rights Reserved.